'Chain The Dogma' Review of "All God's Children"
Perry Bulwer wrote a very insightful article about our documentary All God's Children on his blog Chain The Dogma. He not only reviewed the film but expanded his thorough research and made some fascinating connections between the Christian and Missionary Alliance (who ran the boarding school where the abuse occurred) and Children of God (now The Family International), e.g., the fact that Children of God founder David Berg had once been a C&MA minister - but probably more importantly the similarities in some of the ideology that became so harmful to the children in both organizations. "Christian dogma, such as 'sacrificing' or giving up your children in order to do God's work, adhered to by both groups [C&MA and CoG], is directly responsible for many of the systemic abuses committed within them." 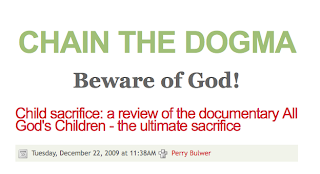 Perry Bulwer escaped from the cult Children of God in 1991 and now maintains the blog Chain The Dogma - Beware of God!, which provides an incredible resource of articles, book recommendations and other media about Religion & Child Abuse, Religions & Cults and other related subjects.